Our mission statement : To introduce Jesus to fishermen and their families and to invite them into a relationship with Him, through Bass Fishing Tournaments. Inspirational messages of the gospel are shared with all members and their families in a non-threatening, non-forceful way. We invite them to accept Jesus as their Lord and Savior and to rededicate their lives to Him. 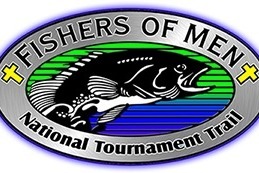 FOM (Fishers Of Men) is listed with the IRS as a non-profit organization which means All donations are tax deductible. FOM is a non-denominational ministry. Our ministry is one of sowing the seeds of the pure and simple Gospel of Jesus' Love. After an angler accepts Christ, we offer some follow-up assistance and encourage him/her to find a church near their home, that best fits their needs. FOM has Two different Tournament Trails. One is the Team Series, which is made up of two people, either male or female. The other is the Legacy Series. This team is composed of one youth - under 16 years, and one adult - over 18 years. The teams can be made up of either male or female persons. Even though entry fees are collected at each tournament, we still fall short in covering the costs. Entry fees are used to pay out prize money for 1 out of every 5 teams. The reason for the fundraising is simple - there are expenses that are over and above the entry fees received. Some examples of extra costs are: DNR Permits, City Permits, Law Enforcement Fees, Speakers , Building or Property Rental for meetings/weigh ins, etc. Awards, Trophies, prizes for both trails, meals that are served at the Friday night meetings at the Legacy Series, costs the volunteers incur such as fuel and meals. Your donations would be greatly appreciated! It would enable us to reach out to adults and youth through something they love - Fishing. You would help us keep this ministry active and growing for years to come.